With the rise of female shooting being well documented, more and more ladies shooting groups have popped up, with one in particular making a regular appearance at Southdown. The Shotgun and Chelsea Gun Club has changed the face of shooting, from bearded men in flat caps to a more equal depiction in the sport. The Club is a forerunner in the sport and now has over 1,000+ members all over the UK, including members in America, China and Australia.With their next event coming up at the club on 1stDecember we spoke to Jane who runs the events for the club in the South to tell us what the community is all about. What was the driver behind setting up the club? It was to make shooting accessible to women of all ages and backgrounds, in a friendly, non-pressured environment. It also enables women to meet like-minded ladies and I’m pleased to say that many ladies (myself included) have forged some very good friendships. Established in 2011, we have now been running for 7 years. Why do you think it was needed? It has certainly made shooting accessible to women of all ages and backgrounds, which is definitely a good thing. Do you have to be an experienced shooter to join? No, its open to all abilities, from ladies who have never touched a gun before to those who have been shooting for years – no experience or gun is required to attend our events. We’re experts in total beginners and we only use the finest shooting schools, best instructors and we only use low recoil cartridges. Jane explains that confidence, support, and the sisterhood are at the core of the Club. Many of their members have described it as ‘life-changing’due to having new found confidence, so many new friends, and a great new hobby. 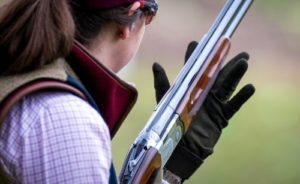 To their testament, many ladies have started their clay shooting journeys through the club andare now on their way to becoming World class shots – including our very own Talent Pool winner Sammy Halsey, who has shot with the club many times, and speaks very highly of them. They even have some members on the Olympic pathway with their eyes firmly focused on Tokyo 2020, and are well supported by female World champion clay shots and Olympian and Commonwealth medalists. For the Shotgun and Chelsea Gun Club, community is right at the heart of everything they do, which is the biggest draw for their members. And who would be against signing up for that…plus a slice of cake!